Cute, simple and quick. Here's another project using my Bottle Sack Pattern. The Bottle Sack Pattern includes 3 sizes of bags and is the perfect way to package a bottle of wine or champagne for the special couple. The Bottle Sack Pattern is item #TBX12 and it retails for $6.99. And here's one last idea for this stamp set. This one uses my new Acrylic Shadowbox Frame #ACR20 Raine Large. This frame measures 7 3/8" x 7 3/8" and retails for $7.99. Really? Really, $7.99! I think it's an amazing price (and manufactured right here in the USA). There are so many ways to use these frames. Be sure to download the Spring Flyer, if you haven't already done so, it contains dozens of ideas. You can download it by clicking HERE or if you want to take a look at all of the flyers available for download, they're listed at the top of the red bar to the right. AND NOW....I'll bet you're interested in who the lucky winner is for the Bird Song set of stamps that was featured in last week's post. Spring is such a lovely time of year. I woke this morning to the sound of light rain falling and the birds singing their praises. What a fabulous way to wake up. These projects are gorgeous!! I love this stamp set... lots of versatility... and I would be thrilled to win it. Thanks so much for the opportunity. Sooo.... Julia, if you would please contact me by Monday, May 17 to claim your prize, I'll get it right out to you. Please email me your address - darcieheater@gmail.com. OK, I'll be posting information on another FREEBIE later this week, be sure to check back for details! As a way of letting you know how much I appreciate you, I wanted to share a little printable freebie with you. This one is for all the Mothers out there, young...old...or in between! The little gift sack measures 3 3/8" wide x 3" deep x 6 1/2" tall. Print it on a heavy weight bright white card stock. (Print TWO of the gift bag pages). Below are the printouts for this project. To download an "easy-to-print" version of the printables, you need to have Adobe Acrobat Reader installed on your computer. If you don't have Reader installed, you can go HERE and download it for FREE. (When the page opens, click on the button that says "Get Adobe Reader"). Click HERE and HERE to open the pdf versions of the printouts. Be sure to check out the PREVIOUS POST... enter the drawing for the FREE SET OF RUBBER STAMPS AND TEMPLATE by placing a comment on the PREVIOUS POST. There's still time to win! I hope you enjoy the gift sack and that you have an amazing Mother's Day! I wanted to share some close ups of my new stamp sets and was trying to decide which one to show you. I picked this set "JCS0112 Material Girl" as it seemed appropriate for where I'm headed this weekend. I'm going up to Puyallup, Washington for the "Sew Expo" show. It's a rare occurrence that I get to go to a show and not be there to exhibit...but just for the fun of it. In fact this is the only show I can say that about, lol. It's a huge show (400 vendors) and it takes up the whole Western Washington State Fairgrounds. I'm excited to go soak up all the wonderful sewing/quilting/needlecraft goodness that the show has to offer. The set shown above is JCS0112 Material Girl and it retails for $24.95. This set is a larger set of red rubber cling mounted stamps. The Polymer set retails for $11.95. (The images shown above are reduced in size. To view the flyer showing the images at full size click HERE to go to the blog post that explains how to download the flyer. The purse makes an adorable way to present a special someone with a little gift or baked goods. This frame is #ACR16 Tristan Acrylic Frame Large and it retails for $7.99. The frame comes with a chipboard backing, 3 "shadowbox" chipboard layers, 4 frame clips and an acrylic shape for the front of the frame. We embellished this one with our Acrylic Gem beads. The Big Bite Cropadile can punch through the acrylic if you want more holes for hanging the frame, or for hanging the jewels from the bottom of the frame. Tonya punched each layer separately for the jewel hanging from the bottom of the frame. I loooove these frames, we're having a ton of fun with them! I'm working on a set of sewing patterns (in my spare time which hasn't been much lately! ), and I'm wondering how many of my blog friends also sew? If you leave me a comment on THIS post and tell me if you sew or not and if so, what you like to sew.... I'll enter your name in a drawing to WIN THIS SET OF STAMPS! Post your comments by Wednesday, March 3 to enter. I will draw a name on Thursday, March 4. The winner will have until Sunday March 7 to claim their prize by emailing me their address. I hope you have a great weekend and that signs of Spring are starting to materialize in your part of the country. We had a really warm week this past week and many of the buds are already starting to pop here. How About Some Free Pumpkins? Time to get back to the fun stuff here! I was in Hawaii week before last, home for a couple of days, then in Rhinebeck, NY (which is 6 time zones away from Hawaii!) for the Stamp Scrap Art Tour show last weekend. I really enjoyed getting to visit with all of you who participated in that show, I just love that area of the country. My son attended a college in that area and I was fortunate to get to visit him quite a bit while he was there....'tho it made me miss him more being there, as he's way far away now and I won't have the opportunity to see him for quite awhile. The weather was absolutely gorgeous with a hint of Fall in the air, crystal clear blue skies and a nice little breeze. I was glad to get home and have been sifting through the pile of work on my desk after being gone so long. If you're interested in ordering the pattern, it is item #PSX03 Jumbo Purse Pattern and it retails for $5.99. It can be ordered by calling our toll free number 1-800-945-3980 or by clicking HERE. This is another son, my daughter-in-law and more adorable grandsons! How would you like to win this stamp set? Just place a comment on THIS post by midnight Pacific time on FRIDAY, October 2, (Holy Cow! October already!) and I'll randomly draw a name on Monday, October 5th. I'll post the winner's name on the blog on Monday, October 5, and the winner will have until Thursday, October 8th to contact me. It will be the winner's responsibility to contact me by October 8th, as I won't be re-drawing. (Make sure you post the comment at the end of THIS post to be eligible for this drawing). OK, more freebies coming soon! Have you heard about Darcie's Club? If you haven't had the opportunity to visit our booth at a local stamp convention, chances are you may not have heard about our Club program. I wanted to take the opportunity today to tell you about it.... AND give you another chance to WIN A FREE SET OF OUR NEW CLEAR POLYMER STAMPS! Darcie's Club is a program where you can receive brand new merchandise at a huge savings over retail prices. It's an automatic shipment program, where every 4 - 6 weeks we send you an assortment of brand new products. These are products that haven't even been released to stores yet. The Club is a great source of new ideas and gives you a chance to try out new projects. Below is a photo of our most recent Club shipment. The products shown in the lower half of the photo can be used to make the projects in the upper half of the photo. Shown above is one of the featured projects, the card on the right with the house and tree. Items included to complete the card are: a Step-by-Step Instruction sheet with photo, several sheets of colored card stock, and a printed sheet with the images printed to the exact shape you need for the card. That way you can use the rubber stamps to complete the card, OR use the printed cutouts to complete it. It makes it quick and easy! Here's another featured project...it also includes the Instruction sheet, colored card stocks and the images printed to shape...everything you need to make the card shown at the right side of the frame. AND (!) Another card!!! Same thing.... Instruction sheet, colored card stock and images printed to shape. 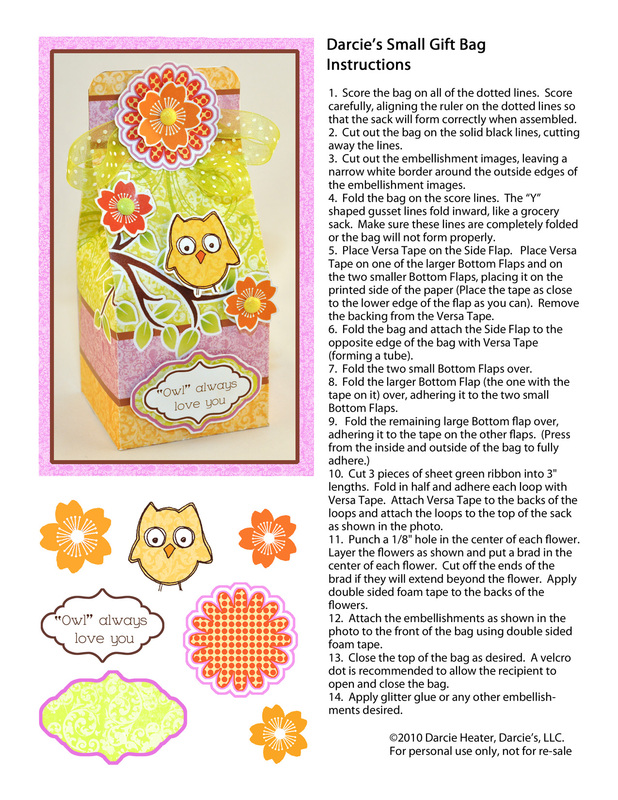 If you use the stamps to complete the projects, you can use the the printed images to make other projects. Nope, not done yet! Shown in this photo are two of our Jumbo U-Cuts, which you can use to make our super quick and super easy little gift bags. These bags, shown in the photos below are a great way to package little homemade treats or small gifts to present them to someone special. Each shipment is $26.99 plus $8.99 shipping. There is no set term for membership, if you want to cancel at any time, you can do so by notifying us in writing. If you receive a kit that you don't like or think you won't use, you can return it to us for a refund. We don't refund the shipping cost, but we do refund the kit price. The kits each contain over $40.00 worth of merchandise. OR you can fax it to us at 1-888-401-2979. If you want to scan it and email it, you can send it to ssherman@royalacme.com or info@darcie.com. If Darcie's Club is something you think you'd like to try and you decide to join in the next 30 days.... write this code in the "SPECIAL PROMOTIONS CODE" space at the bottom of the form: DCCLUBBLOG. We will send you a little sampler package of some of our newest papers as a thank you gift (it will be included in your first shipment). When you sign up for the Club, you have the option of receiving the last shipment immediately (which would be this house set), or waiting for the next shipment (which is a combination Fall/Winter/Valentine/General Occasions set.... or taking them BOTH. Please specify on the form which shipments you want. 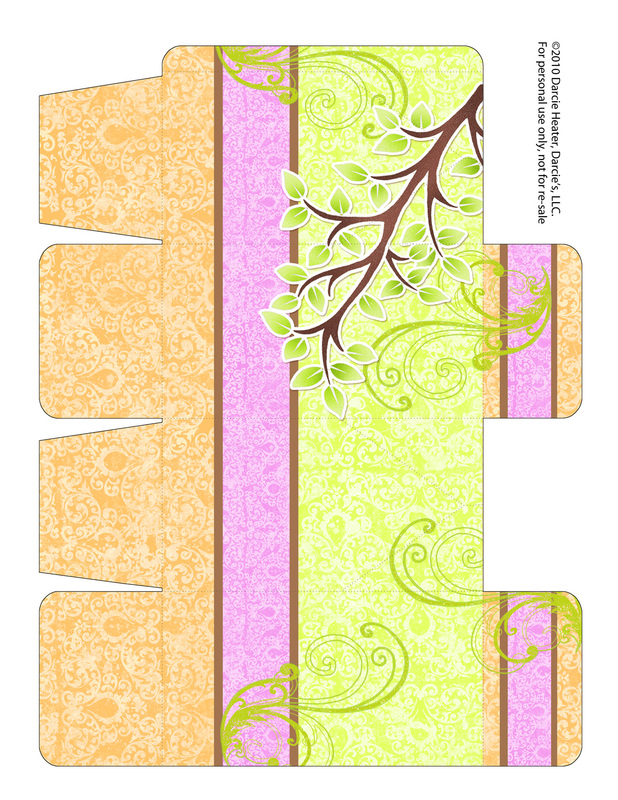 HOW WOULD YOU LIKE TO WIN THE STAMP SET SHOWN IN THIS POST (Item #POL9 FLOURISH HOUSE)?!? Just place a comment on THIS post by midnight Pacific time on SUNDAY, SEPTEMBER 6. I'll randomly draw a name on Monday, September 7. I'll post the winner's name on the blog on Monday, September 7, and the winner will have until Friday, September 11 to contact me. It will be the winner's responsibility to contact me by September 11, as I won't be re-drawing. (Make sure you post the comment at the end of THIS post to be eligible for this drawing). I'll be talking to you soon.... going to go work on that Blackberry Cobbler I promised you.